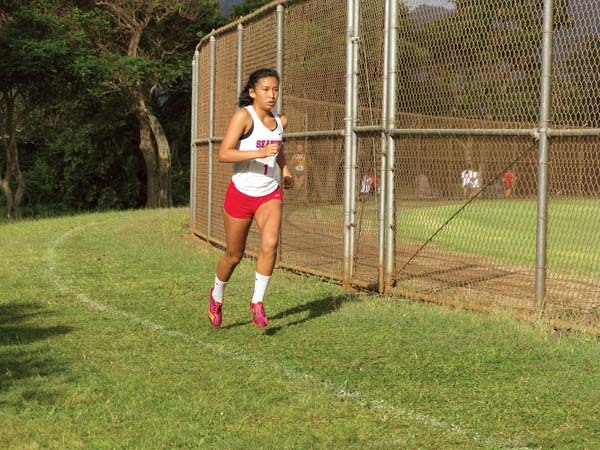 During the offseason, the Maui High School boys cross country team and Seabury Hall’s Chloe Gangnath had different paths on their way to becoming state cross country champions. 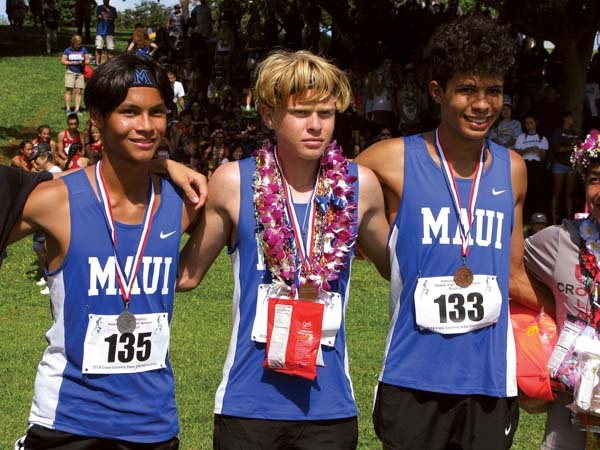 In Kahului, the Sabers returned Adam Hakola and Hunter Shields, but also welcomed Maui Prep transfer Damon Wakefield to their team, thus forming a triple threat that dominated the Maui Interscholastic League and had hopes of bringing home the school’s first cross country state crown. In Olinda, Gangnath spent the summer preparing to not only challenge herself to get faster, but also fill the shoes of Veronica Winham as the leader of the Spartans. All four accomplished their goals. Hakola, Shields and Wakefield took turns taking the top spots at MIL meets on their way to a 2-3-4 finish and a Division I team crown at the state championships, and Gangnath dominated her competition at every level on her way to the girls individual state title. That’s why it’s no surprise that Hakola, Shields and Wakefield are The Maui News’ MIL Co-Boy Runners of the Year and Gangnath is the MIL Girl Runner of the Year. After the Sabers finished second at last year’s state championship, they decided to do whatever it took to come in first this time around. 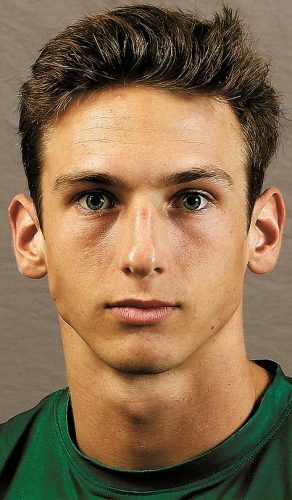 What Hakola and his teammates didn’t expect was how much of a lift Wakefield would provide when he joined the team. The Sabers, with coach Jared Welch, got over the hump, becoming the first Neighbor Island public school to win the D-I crown in the process. Joining Hakola, Shields and Wakefield on the MIL All-Star team are the other top-10 finishers from the league championship meet: Seabury Hall’s Cole Davidson, Gabe Frampton, Jonathan Merchant and Kaeo Keomaka, Maui Prep’s Ozzi Doherty, Maui High’s Connor Kong and King Kekaulike’s Ansel Newman. Maui High will no doubt challenge for another MIL and state title next season as Hakola, Shields and Wakefield all return. Unlike the Sabers trio, Gangnath was far and away the fastest runner not only on her own team, but in the league and the state — the senior won the girls state race by over 47 seconds. 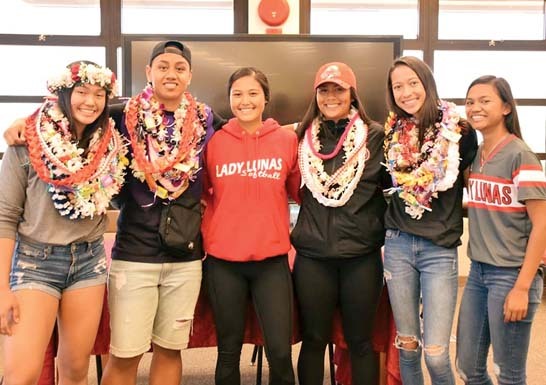 With the graduation of Winham, a two-time state champion, and several other Spartans who had been key to extending Seabury Hall’s run of six straight Division II state team titles, it fell on Gangnath to lead a fairly young group. 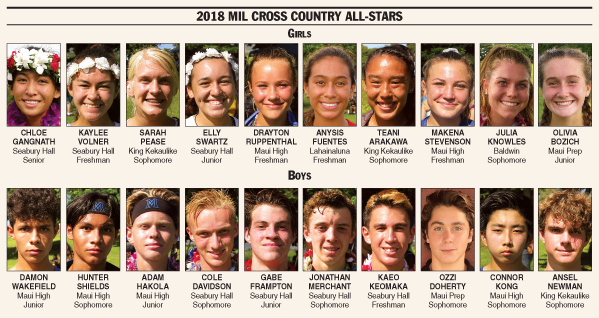 Joining Gangnath on the MIL All-Star team are teammates Kaylee Volner and Elly Swartz, King Kekaulike’s Sarah Pease and Teani Arakawa, Maui High’s Drayton Ruppenthal and Makena Stevenson, Lahainaluna’s Anysis Fuentes, Baldwin’s Julia Knowles and Maui Prep’s Olivia Bozich. While Gangnath’s high school cross country career has come to an end, she’s looking forward to finding a college that will allow her to compete at a high level and study chemistry. “I want to go somewhere that has a lot of school spirit,” Gangnath said.